I love them. I’ve always loved them. I’ve always had one. Even when wood cabinets were all the rage. I had a white kitchen. 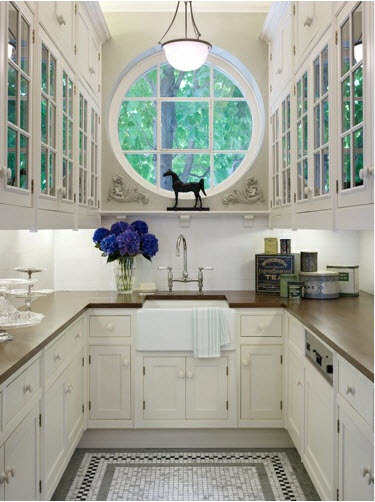 But, for me, there’s just something about a white kitchen that says: Pure. Pristine. Clean. And, because my very favorite color in the world -- if I HAD to pick one -- is cobalt blue, well . . . then a white kitchen is just the very best backdrop for my bright hit of color. I fell in love with cobalt when I lived in Norway and visited a cobalt mine. I started collecting cobalt glassware and dishes, and it soon became an obsession. So now, because I’m considering gutting my existing white kitchen and bringing on some quality, I still want to maintain that whiteness, that purity, that backdrop for my cobalt obsession. So here I go! Another white kitchen, here I come! Want to see my own white kitchen remodel? Check it out at the link below. I’m finally sharing some finished photos of my own kitchen remodel which we completed almost a year ago now. I must say....I have no regrets.